Asks for the directory where Tony Hawk's Underground 2 is located. Asks for the language you want the game to be in. Press the write button and it'll generate a .reg file in the same directory that the registry fixer program is in. 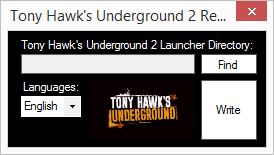 This is useful for when you need to use the Tony Hawk's Underground 2 configurator program and if it has difficulty figuring out where you have the game installed. This utility will generate the necessary registry keys to get the configurator utility to function.